Our overnight or daily price per person is a set fee, there are no discounts. We are willing to negotiate the price on activities or catering you hire us to do for you, which is in addition to the accommodation charge per person. 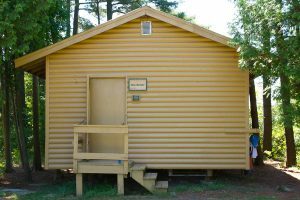 No, there are not bathrooms in the cabins. We believe it is more sanitary to have central bathrooms for use. There are bathrooms located on cabin hill, in Harmony House, in MacDonald Lodge and in the Feathers cottage for use during your stay. From any cabin, the longest walk to a bathroom is 1 minute. Can we bring RV’s or Trailers and are there hookups for them? Yes, we have informal parking spots for RV’s & Trailers around our main dining hall MacDonald Lodge with the option to plug into household 110V electrical circuits (bring your own extension cords please). There is potable water available from an outdoor tap on the back of MacDonald Lodge. There are no sewage hookups available. Can we cook our own food? Yes, if renting either MacDonald Lodge, Harmony House or Feathers, you can use any of these 3 kitchens to prepare your food. 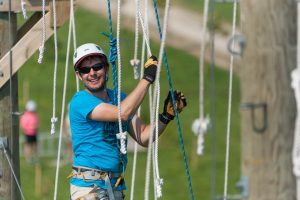 How does it work to have Camp Kintail run program for our rental group, such as the high ropes? We charge a fee for our staff to provide programming for your group. The fee is negotiable based on how many participants you will have in your groups and how many activities you would like to offer. We can serve family style to the tables or buffet style for any group. We recommend buffet style for groups under 80-100 people, and family style for groups over 80-100 people. Meals can be served plated to tables, but there is an additional cost for this service. Is it worth coming for a tour? Yes, guests whom have had tours have told us how useful it is to see all the buildings & facilities. 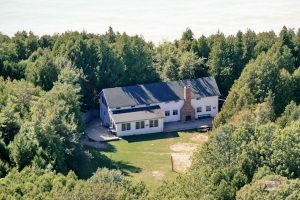 We are always told the site & buildings is more beautiful than the pictures allow for, and only a tour allows someone to feel the clean air from Lake Huron refresh you as you gaze on the stunning beach. Is there enough hot water? Camp Kintail has a commercial boiler system that was updated 2 years ago. It is impossible for your group to run out of hot water in MacDonald Lodge. Is your catered food healthy? Definitely. Our chef prepares our food in our commercial kitchen using the best ingredients available. For example, all of our cheese comes from a local farmer owned co-op Pine River Cheese, that is renowned for excellent quality cheese. We never use cheese powders or processed cheeses. What is included with your catering? Camp Kintail has an excellent reputation for our catering, and we work hard to keep it that way. The menu can be customized by you, and every meal includes unlimited coffee, tea, juice & fresh fruit. There is always lots of fresh, hot food. A salad buffet is available as an option. When can I tour the camp & how long does a tour take? We will give you a tour any time of the year, just contact Camp Kintail and let us know when you would like to come. You should allow an hour for a general tour of the site, buildings & activities.